Pictures, bumble foot treatment video, plus signs, symptoms, and treatments for fungal and bacterial foot infections in poultry (chickens). ​Dirty bedding-Your chickens bedding should be kept clean and dry. Bedding can be composted for gardens. Some people prefer the deep litter method which if done improperly can cause foot infections. Click here to find out more about the deep litter method. Injury-Sometimes sharp objects left in or around areas your chickens have access too can harm them. If they step on something sharp or a hard sticker, it can get stuck in their feet and cause and infection which can quickly cause bacterial fungal infections. Moldy feed-Can cause bacterial infections, bumble foot, and fungal infections in chicken feet and respiratory systems that can be deadly as they quickly deteriorate your birds condition. 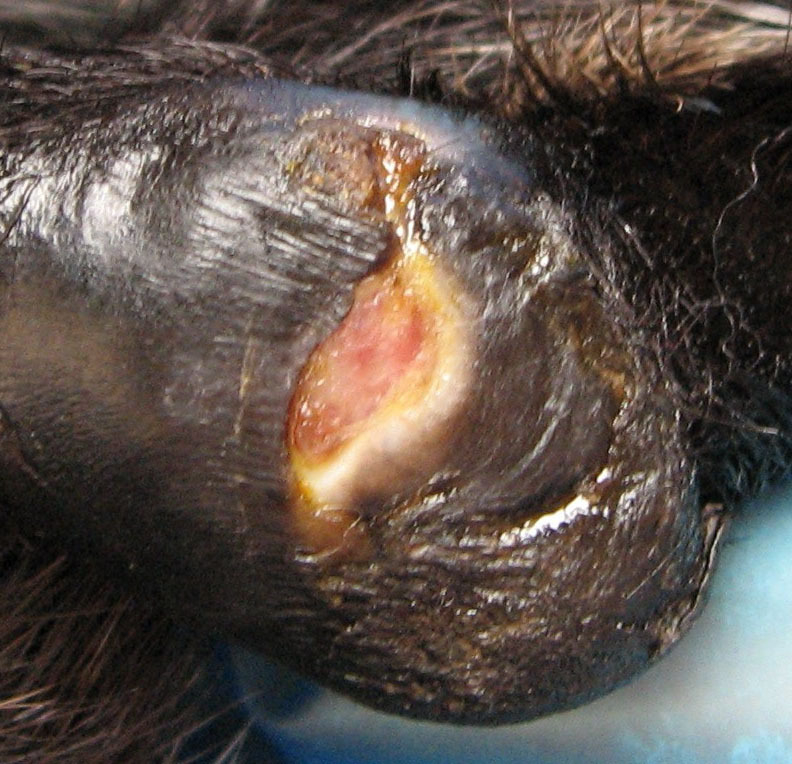 Hard pus filled abscess on the pad on the bottom of the foot covered by a black or brown scab. Mix1 Cup per gallon of water and put in a spray bottle. Spray once every two weeks everywhere chickens go being careful not to get it into feed or water. Dry feet with absorbent, lint free cloth. Apply an anti-fungal cream and wrap the foot with sterile gauze. In addition, apply cream to legs, comb, wattles, under wings, and at the back of the neck and to the breasts, gently rubbing the creme into the feathers. Permission granted to use this video by Jonathan Wallace.